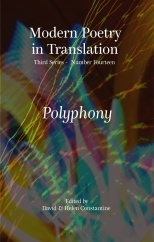 ‘Polyphony’ deals with the different voices of poetic translation: the local, the foreign, the native, the acquired – and the strange hybrids that come into being when the language of home is crossed with that of abroad. This issue of Modern Poetry in Translation is an anthology in celebration of variety, without ever suppressing tones, dialects and utterances it might disturb us to hear. ‘Polyphony’ includes a new translation of Pushkin’s Yevgeni Onegin by D.M. Thomas, along with translations of Valéry Larbaud, Eugene Dubnov, Dorothea Grünzweig. There are also translations out of English: William Blake into Russian, Gerard Manley Hopkins into German, plus a feature on Daniel Huw’s Memories of Ted Hughes 1952-1963 (Five Leaves, 2010), and an essay that delves into the Voices of Poetry, those very voices that make poetry such a vital, vibrant and unique experience for all concerned.